They're both so sad she's gone. Losing a parent can be one of the most tragic experiences of a person's life. As photographer Phil Moore shows, this feeling of deep sadness is not exclusive to humans. For this mountain gorilla whose mother was killed by poachers, the pain is all too real. 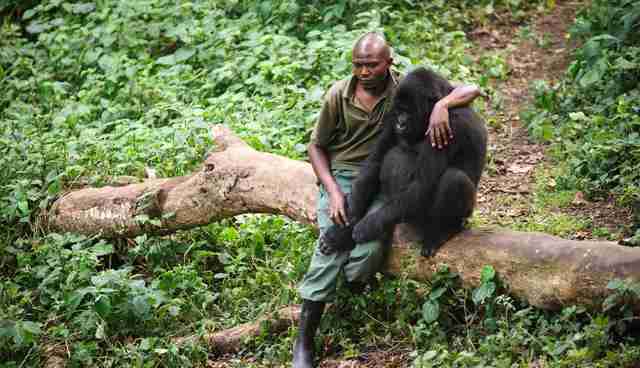 In an emotional display of mourning, the dismayed gorilla holds onto park ranger Patrick Karabaranga for support. Captured in July 2012 at Virunga National Park in the Democratic Republic of Congo, this photograph documents the gorilla's capacity to express loss and Karabaranga's compassion for an individual of another species: a much needed skill in a world where human activity increasingly encroaches upon the lives of wild gorillas. Mountain gorillas have become a critically endangered species as a result of two distinct human activities. First, mass deforestation has resulted in severe habitat loss for not only gorillas but many animals of the rainforest. Every day, 80,000 acres of rainforest are destroyed in the name of profitable industries such as logging, agriculture and mining. By building the infrastructure to transport goods in and out of these rainforests, logging companies unintentionally support the second human threat to gorillas: poachers, who use these roads to access gorilla habitats and transport gorilla meat. Conservation efforts have led to recent successes in restoring the wild gorilla population, but, as showcased by the heartbroken expressions on the faces of both the gorilla and the consoling park ranger, there is still much to be done. Learn more about what you can do to help the gorillas and other wildlife at Virunga National Park, Africa's oldest National Park.